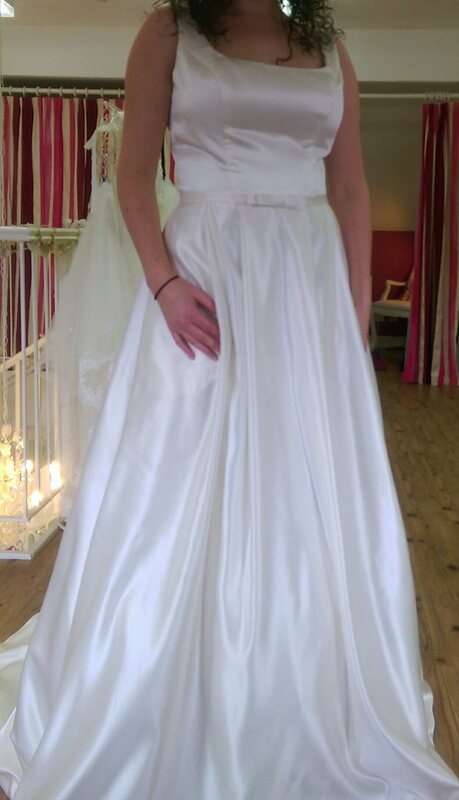 So, it all got a bit more real yesterday as I tried on wedding dresses for the first time. 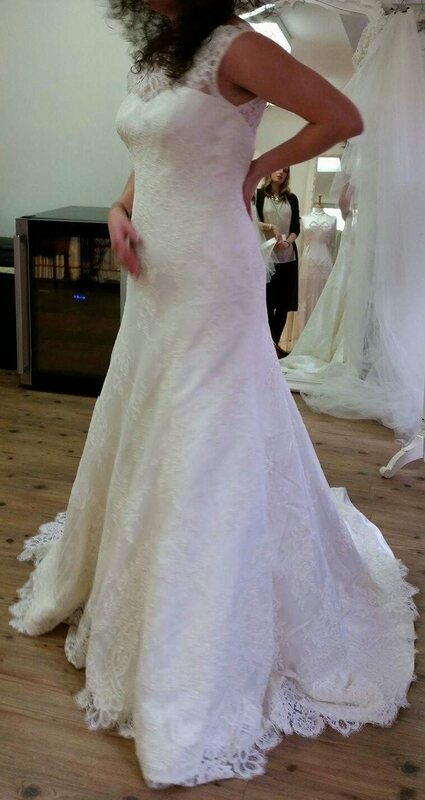 As someone who has watched too many episodes of Don’t Tell The Bride and Say Yes To The Dress to count, the expectation of what trying on dresses should be like was almost overwhelming. I am in no way expecting to find the one as I know I can’t afford to buy one at full price anyway! I almost thought I’d be going on my own but thankfully my MOH was able to make it with me which I couldn’t have been more glad for as her opinion really matters to me. I had booked an appointment with a bridal shop in my home town called Mrs Jones Bridal with the intention of just trying on different styles of dresses so that when I go to sample sales I have a better understanding of what I do and don’t like. Kathryn asked me what type of things I wanted in a dress before picking some dresses off of the racks and asking what I thought of them. 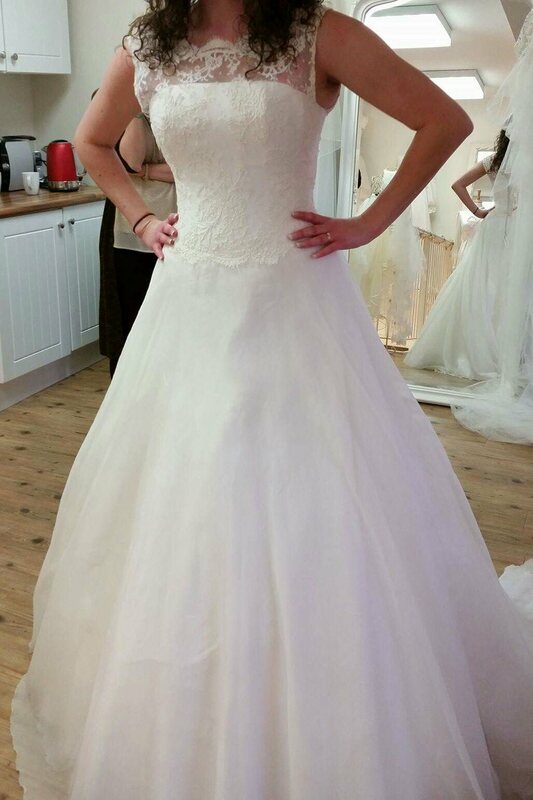 I said that I find myself more drawn to A-Line gowns but was open to try on other shapes except mermaid, that I want lace, definitely do not want strapless and I am not keen on the dress having lots of bling/sparkle. So Kathryn picked a few dresses for me and I tried on a total of 8 dresses. I don’t have pictures of all of them, and the pictures I do have are poor quality, so I do apologise for that but I thought it would be nice to share my experience with you. This Dress fit nicely but was just TOO simple and too shiny for me. This was the dress that both my MOH and I loved on the hanger. We both saw it and thought this would be the one. This dress was stunning – although the skirt was difficult to walk in (my shoes got caught in it twice!) Kathryn assured me it was because it wasn’t the right length for me. I was really surprised by how much I like this dress! Yes you heard me right! I really didn’t think I’d like something that was a bit more figure hugging. The dress hugged by hips and bum and came into the skirt at the top of my thigh. I couldn’t stop looking at myself from the side as the lace on the back looks stunning from the side. This dress made me feel the most like a Bride. It has a hidden corset and a stiff skirt but two layers of Tulle/Organza over the top create a softer appearance which I like. I didn’t mind that it had a bandeau neckline although the main change I’d really have liked to make to the dress would be to have the back in more of a V shape like Sophia. I was really surprised by the fact I loved the fuller skirt so much. It isn’t a ball gown, but isn’t A Line – It’s somewhere in-between. I left Mrs Jones Bridal much surer of what I do and don’t like and feel more confident about attacking sample sales. One of the best things about the whole experience was finding out that the MOH and I are completely in tune with each other. It’s good to know before hitting the sample sales that she will be the perfect person to help me find the perfect dress for me.